Caring for your feet is important, and not only for cosmetic reasons. If you want your feet to look great and feel great, there is nothing easier than getting the Dr. Scholl unit reviewed here that combines the advantages of a thorough massage meant for reviving your tired feet with those of a professional pedicure treatment. The soothing massage delivered by this device is based on hot water and bubbles that help relieving all the tension and pain in your feet, for improved overall well being. Regularly receiving foot massages will help with improving your metabolism and immune system, as well. The number one reason why this model stands head and shoulders above the competition is the nice pedicure set that comes with it. A pumice stone is included, so you can soften the heels which can get really dry and cracked over time. Your feet will really enjoy the royal treatment as they will be soft and pampered like never before. The pedicure kit will be used for polishing your nails and making them look great so you will never feel embarrassed to show them off on the beach. When applying hot water therapy for the feet, the most important aspect is to be able to maintain the water at a constant temperature. This is another area where this machine performs really great. The SMART heat system used by the model makes sure that the water is maintained at the right temperature for as long as you need it, so you do not have to hurry or replace the water. 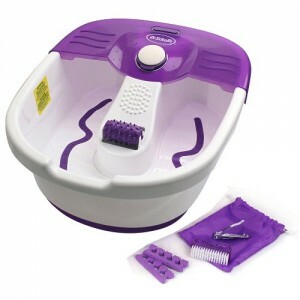 Contributing a lot to the relaxation factor, this feature makes the unit the best home foot spa you can find on the market, according to reviewers. Heat is well known to offer the best advantages for those seeking to relieve pains in the body. 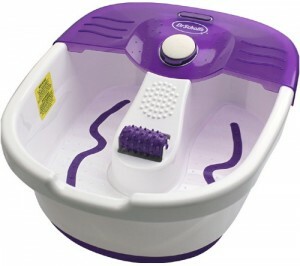 Hot water therapy for the feet has many benefits, which is why so many people absolutely love using the Dr. Scholl unit presented here. People suffering from arthritis have great advantages to enjoy from this type of therapy. This condition is characterized by stiff painful joints and a hot bath helps with these symptoms, allowing sufferers to go about daily tasks, without experiencing as much pain as before. The fact that you can truly maintain the water temperature constant helps you with relieving symptoms of arthritis for as long as it is needed. Hot water is a great way of promoting relaxation. Not only your body, but your mind, too, needs to feel relaxed, so you can reap the benefits. When you are relaxed after a hot bath for your feet, your mind will feel more at ease, and you can truly fight symptoms of anxiety and depression in this manner. The only issue that has been signaled by users so far is that the unit is a little shallow, so you may want to use a towel underneath it, so you do not make a lot of slosh around it. Other than this minor drawback, the unit works as intended and many appreciate how easy it is for them to relax with its help.